Nur 2 Etiketten von insgesamt 3 sind hier ausgestellt. Die anderen unterscheiden sich nur in Kleinigkeiten. Bacardi is the world's largest privately held, family-owned spirits company. 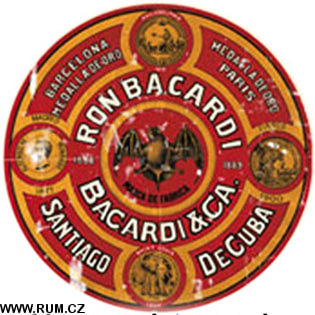 Bacardi is a producer of rums. They sell in excess of 240 million bottles per year in 170 countries. The business is the fourth largest spirits company in the world, sales in 2000 were $2.7 billion. A number of planned stock market flotations have collapsed, the last in 2000. 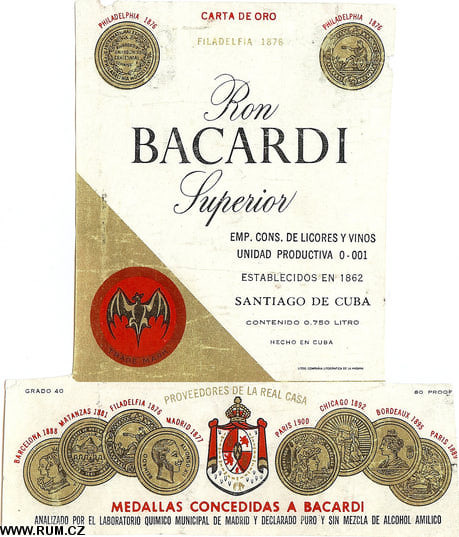 Originally founded by Don Facundo Bacardi Masso in 1862 in Santiago de Cuba, Bacardi is headquartered today in Hamilton, Bermuda with most production in Puerto Rico. Don Facundo, a wine merchant, emigrated from Catalonia to Cuba in the early 19th century. During this period, rum was cheaply made and not considered a refined drink (think: pirates, "yo ho ho" and all that). The drink was rarely sold in upscale taverns. Don Facundo began attempting to "tame" rum. After experimenting with several techniques he hit upon filtering the rum through charcoal. This removed impurities. In addition he aged the rum in oak barrels. This had the effect of "mellowing" the drink. Moving from the experimental stage to a more commercial endeavor, he and his brother José set up shop in a small distillery on February 4, 1862. Their first copper and cast iron still produced 35 barrels of fermented molasses a day. In the rafters of this building lived fruit bats. 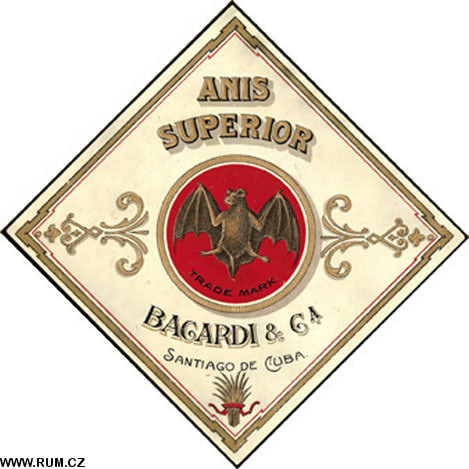 Hence, the Bacardi bat logo. The 1890s were turbulent times for the company. Emilio Bacardi, eldest son of Don Facundo, was exiled from Cuba for anti-colonial activities and his eldest son was fighting as a Cuban Independence fighter in the rebel army. His brothers, Facundo, José, and his brother-in-law, Henri Schueg remained in Cuba with the difficult task of sustaining the company during a period of war. The women in the family were refugees in Kingston, Jamaica. 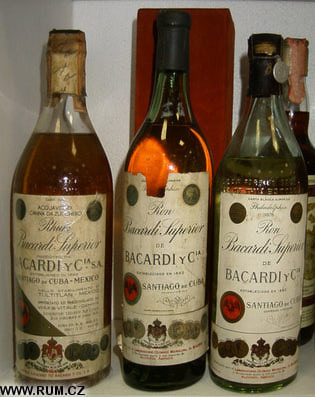 After the Cuban War of Independence, and the American occupation of Cuba, "The Original Cuba Libre" and the Daiquiri cocktail were both originated with Bacardi rum. In 1899, American General Leonard Wood appointed Emilio Bacardi Mayor of Santiago de Cuba. In 1912, Emilio Bacardi traveled to Egypt where he purchased a mummy for the future Emilio Bacardi Moreau Municipal Museum in Santiago de Cuba. In Santiago, his brother Facundo M. Bacardi continued to meticulously supervise the training of the third generation of Family Master Blenders. Henri Schueg, meanwhile, began to expand the company. He opened new bottling plants in Barcelona, Spain and New York City. Due to Prohibition, the New York plant was shutdown. During this time, Cuba became a hotspot for American tourists. In the 1920s, Emilio opened a new distillery in Santiago. During this decade, the art deco Bacardi building was put up in Havana. 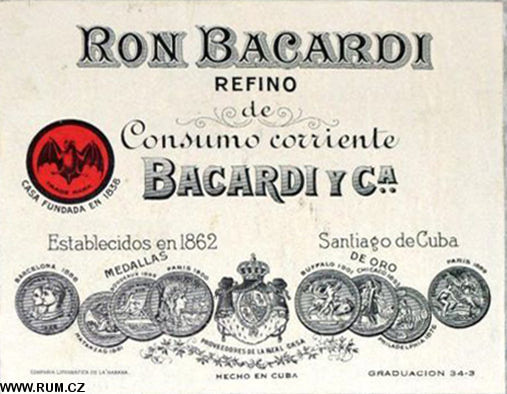 The third generation of the Bacardi family was entering the business. Facundito Bacardi was known to have invited Americans (still subject to Prohibition) to "Come to Cuba and bathe in Bacardi rum." A new product was introduced: "Hatuey" beer. The 1930s brought more a new bottling plant in Mexico City and a new distillery in Puerto Rico under the leadership of Ron Bacardi. 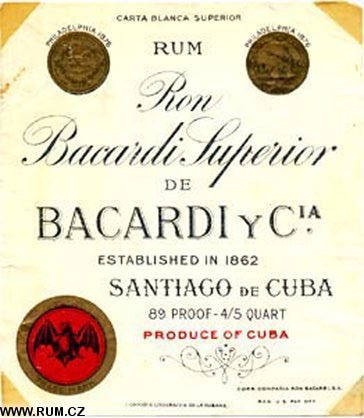 Several trademark disputes went to court during this time regarding use of the Bacardi name on rum produced outside of Cuba. The company's leadership then fell to Henri Schueg who managed to keep the family name on the bottles coming from Puerto Rico. Another case was won by Bacardi which allowed that "...a Bacardi Cocktail is only a Bacardi Cocktail when made with Bacardi rum." During the World War II years the company was led by Henri's son-in-law Jose Pepe Bosch. Pepe founded Bacardi Imports in New York City. He was named Cuba's Minister of the Treasury in 1949. 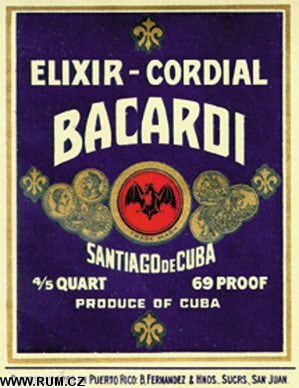 After the Cuban revolution, when Fidel Castro came to power (in 1959), the company Bacardi fled Cuba for the Bahamas, and continued to operate it outside it. 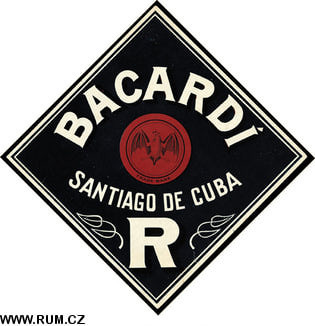 The Cuban government seized the company's assets left in Cuba and strongly dislikes the Bacardi company. A feeling that is reciprocated, it is claimed by Hernando Calvo Ospina that Bacardi financed anti-Castro groups during the 1960s, helped found the Cuban American National Foundation (CANF) in 1981 and supported the Helms-Burton legislation of 1996. Ernest Hemingway mentions Hatuey beer in two of his works: To Have and Have Not and The Old Man and the Sea. 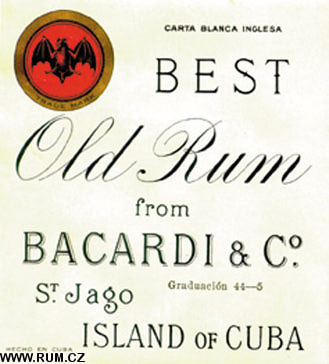 In 1956, Bacardi held a festival in honor of Hemingway winning the Nobel Prize in Literature. Bacardi noted that Puerto Rican rums didn't incur any U.S. import duties - unlike the rum the company was making in Cuba. Soon, a small plant had been built on the site of an old Spanish jail in San Juan in 1936, saving Bacardi $1 a bottle on import duty. 1877 First gold medal in Spain. 1910 First botling plant outside of Cuba in Spain. 1916 Botling plant in New York. 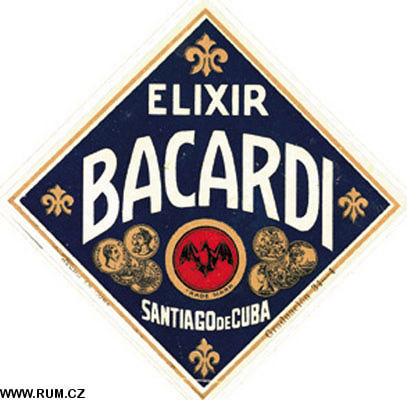 1934 In Mexico was established Bacardi Distillerie. 1936 Distillerie in Puerto Rico was established. 1960 Emigration from Cuba to USA. 1992 Established Bacardi Ltd, Hamilton, Bermuda. Bacardi will close its rum distillery in the Bahamas and transfer manufacturing operations to facilities elsewhere in the Americas, the company said on Thursday. The Nassau plant, which employs 114 people, will close by April 2009. Most of its operations will be absorbed by the company's main rum production site in Catano, Puerto Rico, near the capital of the US Caribbean territory, the company said in a statement. The Bermuda-based company established a presence in the Bahamas in 1965 in part to avoid large duties on shipments from Puerto Rico to Europe, but it said changes in trade agreements and competition compelled them to consolidate.